well, everything that geeks love, but most especially The Lord of the Rings. Because Jason is still a little guy, he pulls off things that a lot of us older, more stodgy Tolkien fans only wish we could get away with -- building snow Balrogs, shouting about the evil Onion Ring in a fast-food joint, and just simply geeking out to the max. Bill Amend was kind enough to answer a few of my questions for this column! Anwyn: I've read where you say you must research games like Diablo and Quake in order to have Jason and Marcus geeking out over them. Is that the case for Lord of the Rings, or were you a fan of Tolkien to start with? Bill Amend: Most of Jason's geeky interests are exaggerated mirrors of my own. Back in high school, I was a big fan of LotR and The Hobbit. I never managed to finish The Silmarillion, though, so I guess my fandom had limits. A: If you were already a fan, can you tell us a little about when you first read the books and how you like the movies? BA: I remember going camping with the Boy Scouts when I was 14, and this one kid stayed cooped up in his tent the whole weekend reading some book while the rest of us were having fun on the rocks and in the river. He was a normally outgoing guy, so this book had to be something pretty special, I thought. It was The Hobbit, and I remember making my Mom take me to a bookstore to buy it as soon as I got back home. The Lord of the Rings followed a few months later. I had one of those boxed sets where you could never get all four books back in. Very frustrating. A: Jason seems to make a seamless transition from books to movies�despite the "direct dialogue" strip you did while Fellowship was filming, Jason seems highly enthusiastic over Jackson's films, changes and all. Can you speak a bit about that? No "purism" conflicts gnawing at you or anything? BA: Considering how far most film adaptations stray from their source material (even the original screenplays), I've been impressed with Jackson and Co.'s fidelity to the books. They're different mediums and require different languages and devices to tell the story. I'm sure Jason has issues, and I've addressed that a little in a couple of strips, like when he got mad that they weren't using "real undead ringwraiths." A: I remember when Jason's mom was running to the mall two or three times a day to sit through Titanic. It was like turnabout is fair play--first thing I'd ever seen her geek on, besides tofu. Do you think there's much difference between that kind of obsession and some of Jason's? For example, are Jason's more cerebral while Andy was hooked on a gooey love story? Is it funnier for a middle-aged woman to be obsessing over Titanic than for Jason and Marcus to obsess over some of their stuff, or do you think it's all the same? BA: When I had the mom go nutso for Titanic, it was a fun moment for her character, as I'd usually portrayed her as the sanest member of the family. We expect Jason to do the fanboy thing, so the humor comes less from surprise as much as it does from his typical over-the-topness. The hard part with the Jason strips is to keep his geekiness fresh and interesting. The first time he waits in line six months before a movie comes out might be funny, but the second time just feels old. A: Can you tell us some of your thoughts on the story of Lord of the Rings? What makes it compelling to you? Can you remark on some of the themes that mean the most to you, such as good vs. evil, nature over mechanization, etc.? BA: I've always liked 'little guys improbably defeat all-powerful forces of evil' stories. And coming from boring suburbia, Middle-earth seemed like a really cool place. A: Can you remark on the frenzied widespread popularity of these movies and the fervor they have generated? Any other large-shadowed obsession that you'd compare it to? Does Jason consider himself above the masses of 'newbies' and such because he knew the story before the movies? 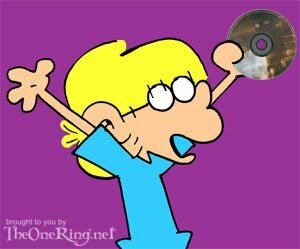 Long may FoxTrot and The Lord of the Rings happily persist in the "geekification of the culture!" Mr. Amend, we salute you!